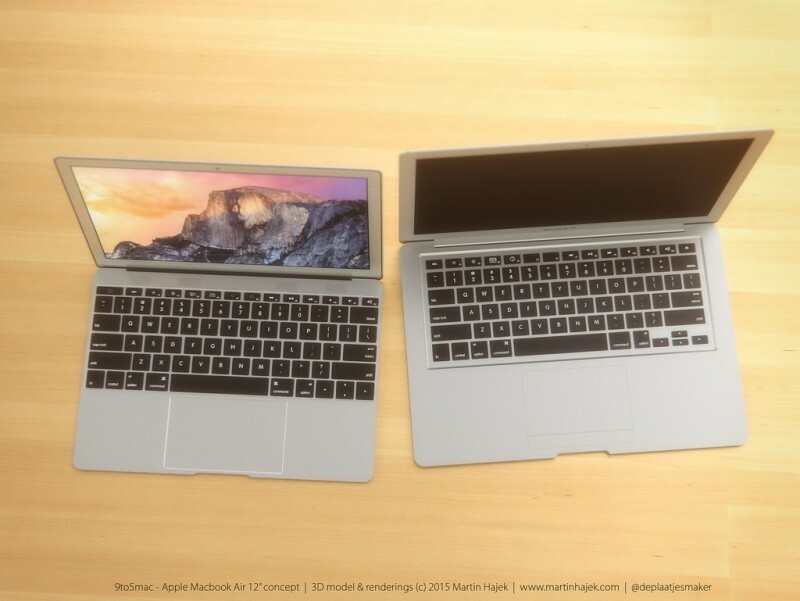 Following a set of artist renditions that gave fans a basic look at Apple's long-rumored 12-inch Retina MacBook Air earlier this week, well-known 3D modeler and designer Martin Hajek has created a set of realistic renderings of the unannounced notebook on his blog. Hajek follows details found in previous reports of the machine, creating the model with an edge-to-edge keyboard relocating the on-board speakers to grilles above the keyboard. Though the display will be 12 inches diagonally, the new MacBook Air will keep roughly the same footprint as the current 11-inch model thanks to slightly narrower bezels surrounding the screen. 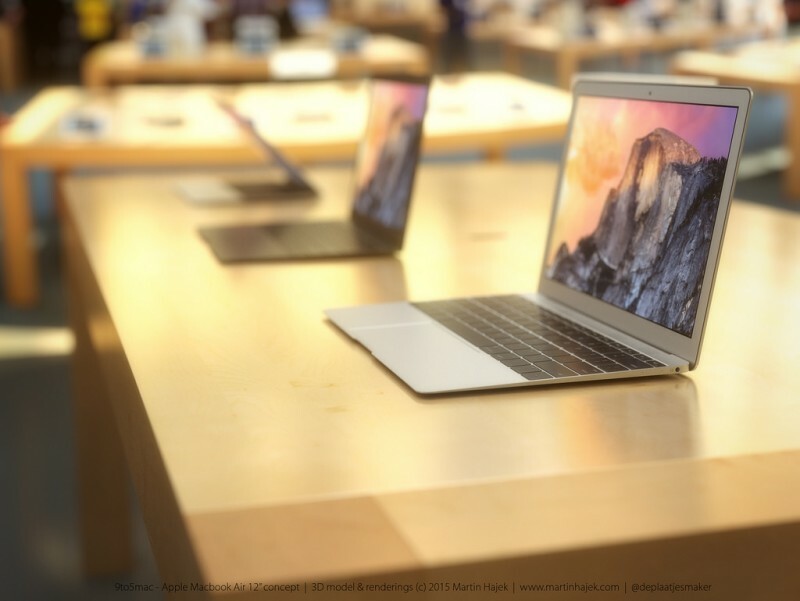 Apple's further attempt to thin out the next generation of MacBooks continues in the Retina MacBook Air's alleged lack of a USB and MagSafe ports, amongst other traditionally expected inputs. The new MacBook will reportedly have just two ports: a headphone jack and a USB Type-C Port, alongside a pair of microphones lining the sides of the device. 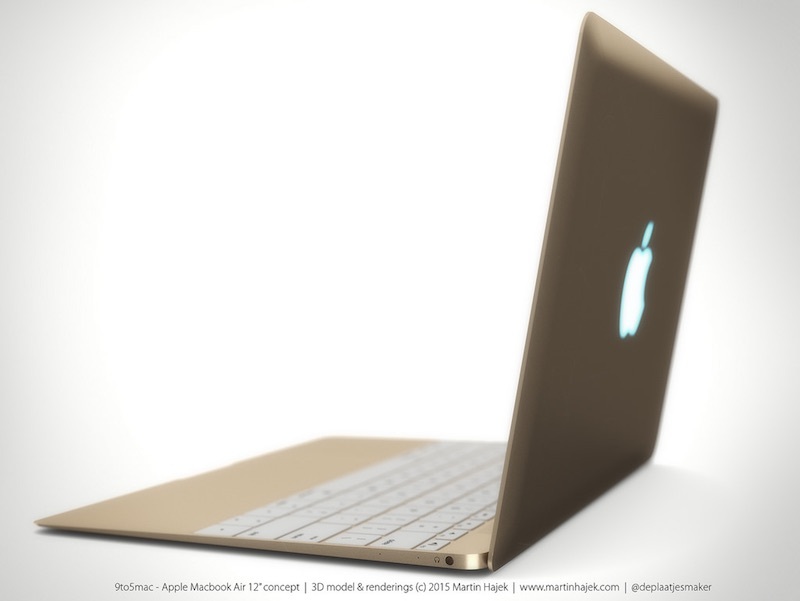 Hajek's renderings also mirror rumors suggesting the Retina MacBook Air will come in multiple color options that include the same Space Gray, Gold, and Silver colors the company has used since the iPhone 5s. Apple has yet to comment on the rumors swirling around the device, though supply chain sources believed the 12-inch MacBook could enter production sometime in early 2015. The full suite of Hajek's renderings can be found on his blog. Should of got rid of that ugly bezel while they were at it. Looks beautiful, but the rMBP is already as thin as I want a laptop to be. The ports barely fit on it as it is, and it's so light that they had to make the MagSafe magnet weaker for it, so it now falls out really easily by accident. EDIT: Only one USB port and no video output?! Pass for sure. I think the bezels are too big. Besides that, nice render. So how the hell are you supposed to charge it? Hmmm... not sure I like the different color options. I loved the aluminum look. I don't think a gold/champagne laptop would look very appealing. This may have been mentioned a dozen times already, but could the 12" MacBook Air and iPad Pro be the same thing? Especially now that we have an iPad Pro mold showing an apparent hinge on the side? Both this concept and the iPad would have the exact same ports as well. Headphone jack and charge port, only the iPad Pro...errr...MacBook Air's port allows for USB connection which could be the "Pro" feature of the new iPad. Looks good, but never thought I'd say that a Dell (the new XPS 13) looks better than that.